Fife vintage furniture specialist Scaramanga is proving to be Lord of the Hollywood props jungle after swinging a supply role on their fifth Tinseltown blockbuster in four years. Only nine months after the award-winning firm saw its padlocks used in Warner Brothers’ Pan, six of its vintage trunks will be seen around the world from today in $180m action drama The Legend Of Tarzan, starring Alexander Skarsgård as Edgar Rice Burroughs’ orphaned baby lord turned Lord of the Jungle. The new role for the Cupar firm, which has just celebrated its 10th birthday, came about when they got a call on a Friday in June 2014 from a props buyer who’s a regular customer and bought one of their leather bags for Tom Cruise to use in 2014 action movie Edge of Tomorrow. He urgently needed six plain vintage trunks by the following Tuesday for a scene in which the mining camp of the Belgian villains is stampeded by wildebeest directed by Tarzan. They had to be plain and priced as competitively as possible because they were to be destroyed in the scene! 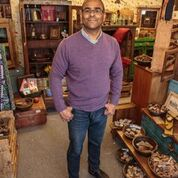 Although they’re specialists in vintage and antique trunks, chests and boxes, Scaramanga owner Carl Morenikeji had to urgently phone round his sources to get some of the trunks because the ones they keep in stock mostly have decorative features. But, as with all their customers, they dispatched the order to Warner Brothers’ Leavesden Studios in Hertfordshire the same day - in time for them to be used when principal photography began on June 30 2014. Now Carl and his team are looking forward to seeing their trunks in 3D on the big screen…if only briefly before the wildebeest destroy them! The Legend of Tarzan is set in the Belgian Congo in the years since the man known as Tarzan left the jungles of Africa behind for life as John Clayton III, Lord Greystoke, with his beloved wife, Jane, at his side. His aristocrat parents died after bringing him to Africa and being killed by the apes. He was adopted by a female gorilla and raised as their leader. The new movie, partly inspired by Joseph Conrad's Heart of Darkness, sees him invited back to the Congo to serve as a trade emissary of Parliament and investigate the activities at a Belgian mining encampment, unaware he is a pawn in a deadly game masterminded by Belgian Captain Leon Rom (Christoph Waltz). The film also stars Margot Robbie as Jane, Jim Broadbent, Samuel L. Jackson, Sir John Hurt and Djimon Hounsou. A working waterfall and a 100-foot-long collapsible pier were assembled at Leavesden for the 70 days of filming there. The results will be shown in 3D, IMAX 3D and 2D. Supplying movies and TV shows with hard-to-find authentic vintage items is a regular order for the award-winning Fife firm. Previous Hollywood customers include 2012 Lord of the Rings blockbuster The Hobbit - they supplied the antique brass padlocks in Bilbo’s house - 2014 Disney Sleeping Beauty prequel Maleficent starring Angelia Jolie – Scaramanga provided more than 100 medieval-looking pieces – and 2012 Tim Burton epic Dark Shadows - they supplied trunks for Liverpool Docks scenes. The firm also sold one of their iconic leather bags to 2014 Tom Cruise movie Edge of Tomorrow, but it didn’t make it onto the big screen. The company, which also sells its bags, vintage furniture and homewares online and in its Cupar store, has also been used as a supplier of vintage props for TV shows including Strictly Come Dancing, Celebrity Big Brother, Peaky Blinders, Jericho, Hollyoaks and 60 Minute Makeover. Speaking about the firm’s latest Hollywood deal, Carl Morenikeji said: “We’re incredibly proud and delighted to have our products appear in a fifth Hollywood movie in just four years. “When I founded Scaramanga 10 years ago and named it after a Bond movie character (Christopher Lee’s assassin in The Man With The Golden Gun), I never imagined that by now our reputation for original vintage and antique items, as well as our own bags, would be so good that we’d become the first-choice supplier for so many Hollywood movie props buyers.